All the ancient warriors had was bows, arrows, their hands and an enemy target to shoot at. Best Hunting Bow Stabilizer probably was not even at the back of their mind to buy. However, the technology of this weapon has become so advanced that bows don’t look like what they used too. The original idea behind it was simpleness but today there is a whole science behind every detail. The purpose of bows has also evolved with its looks. Read this article further and learn about one of the most important parts of a bow that increases its precision and balance. People spend a lot of time deciding on a good stabilizer. You first have to decide what kind of archer do you want to be. There are sportsmen archers and hunters. When you finish this, then you have to think about three crucial qualities of a stabilizer: weight, length, vibration, and noise reduction/dampening. Weight is important in the balance equation of your stabilizer. You want to be able to hold the bow confidently. Therefore, the stabilizer must not be too heavy. In hunting, nevertheless, the lighter the stabilizer is the better. Remember that you are shooting at moving targets and you’ll need better movability of your hands. Short-length stabilizers are also needed in hunting. It hides the noise and the pray won’t get distracted. The longer ones, however, will give you precision and stability. Vibration is what you actually buy your stabilizer for. It balances the energy at the moment of shooting the arrow from the front to the back, absorbs the shock and betters your accuracy. Customizability: In combination with its lightweight, this stabilizer is available in the size of 6 and 9 inches. Therefore, you will be able to adjust it according to different need. Multi-purposeful: As the sizings are different, you will be able to use the product in both archery and hunting. The six-inch stabilizer will be perfect for keeping the animals away from tracking the noise. The 9 inch one will lessen your pins swaying and boost the accuracy. Design variety: These stabilizers come in different colors (real-tree APG, black, and pink) and the most interesting ones are the camouflage colors very loved by hunters. Good air-flow; The holes in the stabilizer give the air uninterrupted passage which means better-balanced bow. Light-weight: This stabilizer has aluminum-like strength thanks to Ballistix copolymer system yet you won’t feel it. To further amend the weight, especially if the bow has more than three pounds, you have added weights to the stabilizer. Lack of adaptability: Unfortunately Trophy Ridge Static Stabilizer can’t be used with the certain type of bows such as recurve bows. You can switch between different weights and lengths. This will spare you from squandering money on some other products that may fill up the gaps you need for your bow. It also easily screwed in and out. This means that they not only will be able to do everything but will also be able to go everywhere with you. The stabilizer is light yet it puts enough weight on your bow to give the the most accurate shot. Rarely these two adjectives go together in a description of a product of this sort. To have to Best Hunting Bow Stabilizer possible, all you will need is a sling. The sling will help you have a more relaxed grip as you tune the stabilizer in. A brass grommet sling works fine and is used by many archers. However, there could be certain problems with it. There is the risk that stabilizer will not stay in the same position and you risk that it won’t absorb the same amount of energy as it possibly can. The alternative is a paracord. This way, the stabilizer goes straight into the bow. This further means that you’ll exploit all the potential Trophy Ridge can give you. You will not have to think of dropping our bow anymore! The best usage of the product means to experiment with it. Explore everything that it can give you in different surroundings and situations. By choosing the type of sling you want, you can also see what level of looseness you like with your grip. As for the environments, the Best Hunting Bow Stabilizer to go with is the 6-inch version. Leafy woods are the best for the leafy APV stabilizer of 6’’. The torque will be minimized and its light weight will help the portability. Long distance shooters should use the Trophy Ridge, 9’’for the infallible balance between the bow and your body. Mix it up with additional weights you are getting to further support your shots. This product can boast that there are not much debate behinds it. We spot no major fallacies with this product except for a few tiny things. 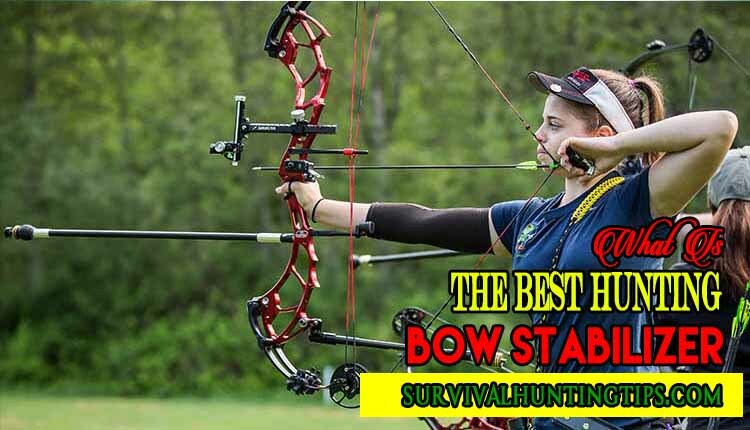 They don’t take anything away from the title of the Best Hunting Bow Stabilizer we gave to Trophy Ridge For the sake of objectiveness, we will mention the following. It sometimes doesn’t come with all parts when ordered? This all depends on the supplier which you buy the product from. Make sure you buy from verified sources. How do you do this? Pay attention to the delivery success rates and comments. With Trophy Ridge you have to be extra careful that rubber covers and weights are there. The 9’’ stabilizer is actually a bit longer? It is possible that it can reach up to 11’’ but this is not a serious issue. This may end up being a problem for some hard shell cases but so far this has not considerably thwarted its performance. Bee Stinger is Based in Utah and many renown hunters and world competitors trust their products. They manufacture tools for target archery, bow hunting and 3D archery. They do not save on quality and put only the best materials such as stainless steel aluminium and carbon. Therefore they make some of the best bowhunting stabilizers on the market. Ultra-light carbon fiber: this component gives the product rigidness and steadiness you need for a clear hit. Rubber SIMS Internal Harmonic Dampener and De-Resonator: This tones down the oscillations of your bow when you release the arrow. Highly durable: Rest assured you will not have to get a replacement in a longer period of time. Is suitable for 3D shooting. Has additional 3.2-ounce weights to further adjust the bow to your preferences. It is a great transition between a target and a hunting stabilizer that because it has the vibration-reduction power of a hunting bow but the length of an archery one. Mounting hardware with machine marks to further optimize your bow. Not too much difference with and without it if you use it with a Halon. Dealing with weights and adjusting the bow properly takes a lot of time. All in all, this is a high-end product that will take you to some victorious archery and hunting competitions. Trophy Ridge, however, has an edge over it for several reasons. It ensures longer distance shots while with Bee Stinger it seems like it often can’t reach twenty yards. Also, we have to take into the consideration the design. The Bee Stinger version indeed is available in every color you can name. BUT- the quality of those colours seems to be on Trophy Edge’s side although the offer is smaller. New Archery has been making the best archery accessories since 1971. They especially pride themselves in Razorbak stainless steel blades and Thunderhead broadhead. They sure know how to make the Best Hunting Bow Stabilizer. Changeable length: Originally, this stabilizer comes in the 8-inch size. However, when you want a smaller stabilizer, all you need to is to take the 3’’ removable extension off. Target archery weight: This is a one pound stabilizer. For your own convenience, there is 2-ounce carbon removable bar. This will make happier all of the hunters and archers accustomed to lighter bows. Extremely quiet: the product turns off all the vibrations and noise which is perfect for hunters. Astounding 80% of animal-hitting accuracy is guaranteed because of the undetectable noise. The stabilizer can’t be easily dismantled when you want to reduce it from eight to five inch size. The screws are very small and there you’ll need some special skills and tools to take them off. It is available only in black color. All of you who love the print you will either have to settle with this or look for a new one. It is heavy on the front end. If we compare this to Trophy Ridge, there is a lot to talk about. Firstly, it has wider range of designs catering to all tastes. Especially in hunting, having an option to choose a cam stabilizer is crucial to stay well hidden. Trophy is also much easier to handle weight-wise. You are offered different – weighing stabilizers that do not take any additional screwdrivers and techniques to take off. It is so touchy that you probably won’t even bother dismantling it in many situations. Material of some parts of this product seem to be questionable. Aluminium bars are breakable which doesn’t promise a lot it terms of you saving money on buying a new product. This sure is one of the Best Hunting Bow Stabilizers because of its high balance and really interesting design. At first look it seems like a mysterious, out-of-this-world key that unlocks every target you imagine. Availability of different weights and lengths: Four-inch stabilizer has six ounces and the 6 inch one is 8 ounces. This goes to say the product is majorly for the outdoor hunters in the wood. CNC machined design: This reduces the torque of your hand. Basically, you will not have to be concerned about bow-rotation and you won’t miss the chance of losing your pray again. Wind resistance; the previously mentioned design also ensures that wind won’t get in between your target and your arrow. The stabilizer will absolutely drag the wind down and ensure a clean-cut win! Mathews harmonic damper: There are four six-inch dampeners and three 4 inch dampeners to reduce any chance the bow will oscillate when you release! Easy to assemble and adaptable to any bow. Trophy here wins primarily because of the variability in weight and length. EBBQ is only for hunting. This isn’t a big deal when you firmly decided hunting is all you will do, but most of the archers like to have a multi-purpose stabiliser and enjoy every action a bow can give for the same price. There is also a difference in coloring which reduces the durability aspect of the EBBQ. It is not an issue that can’t be overlooked, but still, many of you surely like your stabilizers looking good for a bit longer. An overall verdict is that the product is well-worth the investment if you don’t mind it looking a bit shabby after a certain period and additional investment once you want a stabilizer for target archery. Limb Saver is a company to watch out for. They can make the Best Hunting Bow Stabilizer but also firearm, crossbow and tactical products. A good well-rounded producer is a good choice for all of the passionate hunters. Comes in various colors: They offer you a pallet of camo, pink, black and green. In order not to be too flashy on the hunting field, we strongly recommend camo. Caters for hunters: The length of the stabilizer is only 4.5 inches and had 4.5 ounces. A really small stabilizer that will facilitate easier moving around and handling. Noise-canceling nodes: Limb Saver patented NAVCOM technology that assures you instant quieting of any vibration. You are safe even in a close distance from an animal when it comes to scaring it. Won’t happen! Designed for harsh weather: this stabilizer draws your bow fully backward. A sudden gush of winds won’t be able, however, to move your bow in other direction but the animal as the product guarantees you full balance and precision. Its purpose is only for hunting which can be disappointing to those expecting long-range shots. The camo pattern seems to be barely visible. The problem with this product is the same as with the previous one. This stabilizer just can’t promise you a success in target shooting and therefore you’ll have to purchase new if you wish to switch between the two. This is just one of the reasons Trophy Ridge is better than Limb Saver. Another point is the variety in weight which, with the latter product, does not exist. You are cornered to a single 4.5 ounce weight. This is not a nice quality even for a hunting specialized stabilizers. Even with such products, a difference in weigh can mean difference in accuracy. It would be much better if there was at least one more 6 ounce version. They make everything an archer’s heart wants: from slings to, bow cases and, the Best Hunting Bow Stabilizer on the market. They even offer free shipping across the majority of American countries so you’ll not make a miss with them for sure. Different lengths and sizes: There is a 5 inches option weighing 5.3ounces. It is good for super short distances because it is light-weight. Other option is a 8’’ stabilizer of 6.5 ounces. This is what suits all the archers. The third option is a 10’’ version of 10 ounces suitable for extra long shooting distances. It has black and camo finish. There are a lot of holes along its aluminium body. They provide good air-flow and additional balance. Durability is not the stronger point of the product because it is aluminum. The 5’’ version doesn’t look like it helps the precision although it does add to the balance. The reason is that the weight is very small. Here, we can say that this is the closest relevant parallel to the Trophy stabilizer. They both have the variety in weight and length and even the eye-catching shapes and holes inside the body. However, the difference is in material. Aluminum is generally not good to go with as it doesn’t sustain harsh weather conditions. Especially if you are a hunter you will want that your product is sturdy and durable and aluminum just doesn’t promise that. Such low weight versions as the 5-ounce one sometimes do not do much for the bow. You feel steadier but not enough to feel the stabilizer ability. Maybe they should re-think leaving only the 6 ounces one instead as an option for hunters while shortening its length. Trophy Ridge is the Best Hunting Bow Stabilizer all the boxes when it comes to what such a product should have. It has a 6” and 9” inch versions which are a satisfaction to both hunters and archers. It also has a beautiful swing airflow design that fortifies the bows overall balance. Moreover, it is available in different colors from cam to black and pink. You can also play with the weight because it has extensions you can amend on a whim. It is better than other rival products because of the solid quality that seems to never fail. You will never have to think it will get damaged in difficult weather conditions and you can also bring it with you wherever. The parts are easily removable! Some products are close to it but lack the appropriate materials. On the other hand, some rival products just lacking overall quality and practicality or they are not intended for different purposes. With trophy Ridge, you have it all for each situation. It sticks to all the advertisements and lives up to every expectation!